Double is great, Triple is amazing. The Double Dees, originally designed in 2007 were ahead of their time. 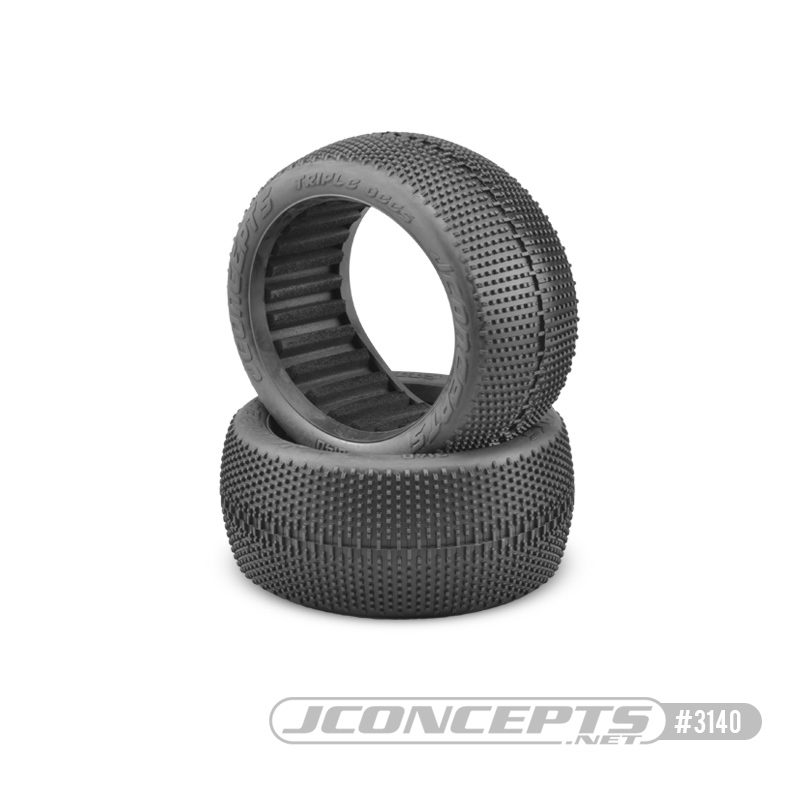 Now the Triple Dees, designed in the future and available now represent the latest in grip from JConcepts. Loose and tacky track conditions require small pin designs and the Triple Dees were a fresh design from the ground-up. Starting with finely spaced square mini lugs, the JConcepts design team spent considerable time proofing this design. Center bar structure is important for wear characteristics and an overlapping and blended center bar was created. The bar draws up the side of the pin to maintain all important support but the main stance is low so the tire maintains its clean-out ability during acceleration. The main-stay of the design is the angled and sharp pins which spread across the carcass in an open pattern touching off the track surface like no-other. Near the side-wall the pins have been trimmed and angled to give racers a smooth driving experience as they enter and exit tacky turns or slightly rough terrain. The Triple Dees tire has been designed to trim overall weight in every possible way. The carcass thickness, pin spacing and diameter have all be optimized for the ultimate performance 1/8th trugy tire. Available in grippy compounds such as blue, green and long-wear R2 the new tires are packaged in reusable packaging for freshness and convenience. The Triple Dees include Dirt-Tech inserts, popularized by its durable nature and color, give customers the package they have been waiting for from JConcepts.